Those were the words I shared to open the Nine Days of Grace: Novena 2014. I was blessed by an invitation to be on the presentation team that year – along with Matt Barmore and Fr. Peter Ely, S.J. As we began, it felt important to locate us – after weeks of planning, writing, and praying, to say: here we are, finally together. 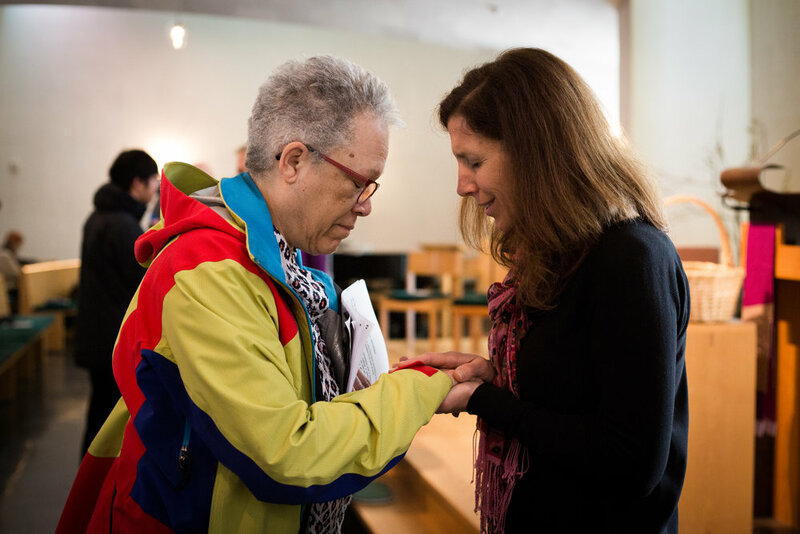 A prayer partner prays with a retreatant after the liturgy, a custom of the Novena. The Novena began long before those words were said aloud, before people entered the chapel and wrote prayers and longings on slips of paper. For me it began when I heard I would be part of the team. As we prepared, I found myself imagining the lives, heartaches, joys and desires of friends and strangers alike. With each sentence I wrote, edited and wrote again, I brought all of you into the room with me. Our 2014 community formed long before we even knew who we were going to be. I imagine that happening now, as our 2018 presenters pray and write and prepare. I imagine them thinking about each of us, trying out sentences that might speak to our heart’s needs and desires, maybe before we have even formed words for them ourselves. I wonder who will sit next to me, what soul-lifting songs are being chosen, and whose prayer will be read aloud and resonate in me so deeply that tears will come to my eyes. Most of all, I wonder how we will all be changed. I recently reread the homilies I wrote three years ago. I remember the last one in particular. I had done most of my preparing and crafting before the Novena began, I thought I knew what I wanted to say. I had a plan. But the Novena is about revelations, surprises, transformation, and that last reflection continued to feel unfinished. Each day as we prayed, as I listened to my co-presenters and received Eucharist – the Spirit continued to move. Relics of St. Francis Xavier and St. Ignatius Loyola to pray with. At 3:00 a.m., the night before my last presentation, I found myself wide awake and sitting at my desk. Writing furiously. Listening furiously. Every nerve was awake and open to hearing something new, something more than I had planned. I rewrote the entire night. Not long after sunrise, I walked to get coffee feeling so exhausted and so very energized at the same time. The Spirit had swept away my plan and whispered new words, new hope. She came to me where I was, stirred my heart and asked me to co-create with her that night. Everything changed. The Novena for me will always be about praying for the grace to believe there is more possible than I can see or understand in any given moment, to be invited into the Spirit’s expansive imagination – so much bigger than mine. We won’t gather until March 7th, but we have already begun. Let’s begin to imagine one another and all that is already stirring in our hearts and community. Let’s begin naming our prayers – let’s write them or whisper or shout them. Soon, together, we will release those prayers - let them rise like incense - and allow God to move through our lives re-creating– entering into the scenes and places where we are having trouble imagining more. It is in those encounters – with God in our deepest realities - that we will be changed. I look forward to praying beside you. Marilyn Nash is the Campus Minister for Social Justice at Seattle University, and is an alumna of Seattle University’s School of Theology & Ministry. Born in Pennsylvania, she moved to Seattle with the Jesuit Volunteer Corps and fell in love with the Pacific Northwest. She has worked in social services, accompanying communities who were homeless or on the margins. Marilyn has a special interest in the body’s relationship to spirituality and worked as a massage therapist for over 10 years. Her passions include Ignatian spirituality and discernment; the intersection of faith and racial justice; accompanying people in making meaning of small moments and big choices; and being an auntie on both coasts.